You know how time flies? I took this picture shortly after a reader mentioned wanting this recipe. Well, as I look at this picture I realize it was at least two years ago! It was taken before we remodeled our kitchen. I am so sorry reader! Bread is something that seems intimidating but I promise you it is really quite easy. If you have never had homemade wheat bread, you are seriously missing out! It is so much better than store-bought wheat. So much. 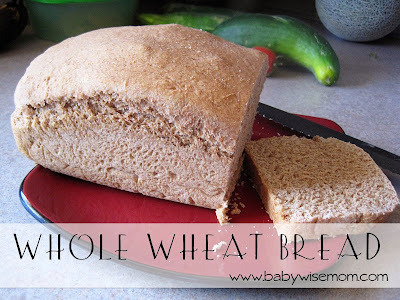 This is the recipe I use for wheat bread. It makes four loaves of bread. That’s a lot! We can go through three loaves before it goes bad, but the fourth usually starts to mold, so we take one to someone we think can use it each time I make bread. Let rise and get frothy. 12 cups whole wheat flour (when making bread, the exact amount of flour varies from day to day, so you might need less and you might need more. Also, we grind our own wheat. We use 8 cups of wheat to get the flour we need. We usually have extra; I save it for making rolls later in the week). You wan to allow this to mix for 8-10 minutes. I should note, I have a Bosche–I am not sure a Kitchen Aide could make this much dough at one time so if you have something other than a Bosche, you might want to try half of the recipe initially. Put the dough into a greased bread pan. You just take a quarter of the dough (if you are doing four loaves) and form it into a cylinder that looks like a loaf of bread. Let raise. You don’t want it to raise too much or it will “fall” and look all wrinkly on top. You let it go until it looks about the right size. This is usually under an hour, but the length of time depends on the temperature in your house. Once it is done, you can take a stick of butter and run it over the top if you would like. Do not let it sit in your bread pan too long–if you do it will get soggy on the bottom. I remove it after a few minutes and let it cool on a wire cooling rack. You are welcome! It is a tasty one.